As we all know that earlier Google Plus can be joined only via invitation. But now Google has officially open Google Plus for everyone. Now no invitation is required to join Google Plus. All you need is a Google account. Signin using your Google account. 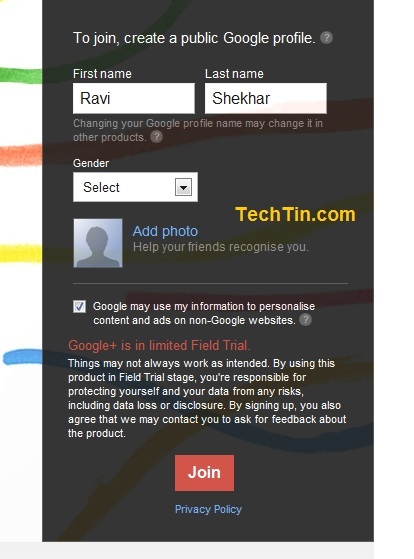 Fill the Google Plus new account form. Done!!! You can start exploring Google Plus. If anyone is still not able to join Google Plus, please leave comment below with your Gmail ID and I will send you invitation. I want an invitation please! Could you please send me an invite? Many thanks! When will Google Plus be available for people under the age of 18? I tried it but it said I was too young to do it. Could i please get one invite? can i have a google plus invite please?? ?